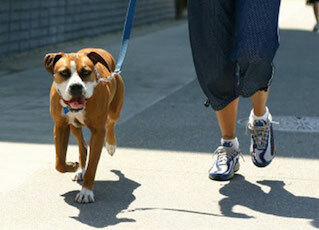 First, let a veterinarian do an assessment of your pet’s body condition. If your pet is overweight, let the veterinarian help you develop a weight loss plan that works for your pet. Ask your veterinarian about the best diet to feed your pet. No doubt Fido will have something to say about this, but there are a few different choices you can try. Most importantly, use the portion your veterinarian recommends. Bad habits are easy when we look at “those eyes” while eating treats ourselves, or when the newest treat arrives on the pet store shelf. Feed your pet at the same time as you eat your meal and don’t give in. No matter how much pets beg, we can best show our affection by keeping them on the healthiest diet possible – their own food. If you have more than one pet, pay attention to the dynamics at mealtime. Some pets eat the food intended for all pets, and others may be intimidated and gobble food before it gets eaten by someone else. Correct portions should be given to all pets, and sometimes separation is the only way to manage mealtime. For grazing cats, there are products which allow specific cats eat their prescribed food only, such as Meow Space (a radio controlled collar gives a cat access to an eating area big enough for the cat and a dish) or Wireless Whiskers (a feeder recognizes which cat is at the feeder and portions food throughout the day for each cat). Separating dogs and cats is also important, since it can cause problems for either species to eat the other’s food – their requirements are not the same. Find other ways to reward your pet. If Fido loves going to the park and losing weight is part of your own New Year’s resolutions, a walk to the park is good for both of you! Cats always love to bat a toy around; encourage play by tossing it or tossing a little catnip on the floor. Cats also love to climb; cat scratching posts and kitty condos encourage activity as well. It takes a whole family to keep pets in shape, and it is important that every member of the family realizes that each one participates in ensuring a pet’s long, happy life. If you suspect your pet is overweight or obese, schedule an appointment today to discuss a healthy plan with your veterinarian. Enjoy a Happy, Healthy New Year!